Mitchell River National Park surrounds the spectacular Mitchell River where it passes between high cliffs. 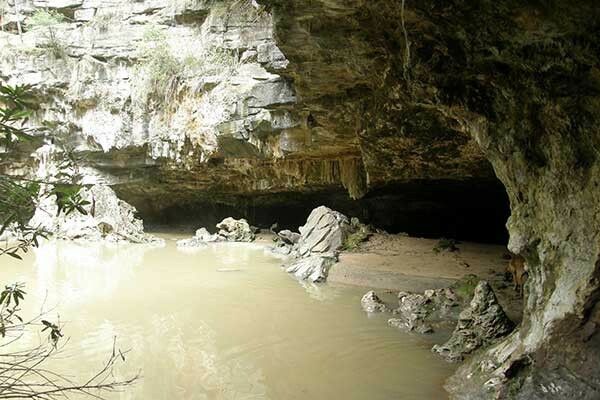 There are several gorges, including the Den of Nargun mentioned in Aboriginal Legends. Remnants of temperate rainforest line some of the gorges. The park is 11,900 ha in size and contains some of Gippsland's best forest country. Canoeing or rafting provides the easiest access to much of the park and there are long walks through the Mitchell River Gorge. The river offers the canoeist short day trips or extended touring through tranquil pools and turbulent rapids down to the Gippsland Lakes. The best time is from July to December. The Mitchell River Walking Track follows the west bank of the river downstream from Angusvale through the gorge to the Den of Nargun. This is a two-day walk of 17 km. Half way through the gorge is Billy Goat Bend with a spectacular, semi-circular cliff known as the Amphitheatre. It is possible to drive to the car park and picnic ground of the Den of Nargun at the southern end of the park. Steep but well made walking tracks lead to the actual cave. A circuit walk takes in the Bluff Lookout and the Mitchell River. Den of Nargun picnic ground has barbecues, toilets and water. Billy Goat Bend Lookout has tables and barbecues. Augusvale camp has pit toilets. A commercial caravan park off Dunbar Road is accessible from the Den of Nargun car park. More than 150 bird species and 25 mammal species have been recorded in the park including 6 species which are rare or threatened in Victoria. The satin bowerbird frequents the rainforest. Giant kanooka trees grow out of the water amid a tangle of vines, ferns sprouting in profusion. Within the gullies grow pittosporum, lillypilly and yellow-wood, their trunks covered with ferns and mosses. On the ridges above the river a drier forest of wattle and eucalypt predominates. Light fires in cleared areas and keep them small. Mitchell River National Park is 300 km from Melbourne (Melway ref: 508 C9). From the Princes Highway (west of Bairnsdale), approach the park via Lindenow or Fernbank along the Bairnsdale-Dargo Road to Waller Road.